The Golden Unicorn turns white in the free spins bonus round where a visually, eye-catching horse will rear-up right out of the reels with a 3D effect. An enchanted world awaits you with a fantasy slot that has palace-triggering free spins with wilds and substitute fairies to add to payline wins. Unicorn slots are popular although more a thing of the 80s, still some magic keeps the unicorn in the picture and in Golden Unicorn slot. The magic of nostalgia, of childhood, where adult-like slots give an inner child a thrill Golden Unicorn slot includes a Grand Jackpot and a gamble game. There are 25 paylines and the bet level can go up to 10 coins per active payline. Deer, ladybugs, fairies are the simple icons that keep it cute. For each win the symbols light up and lets you know where you’ve made a win and a number flashes and reveals the amount of coins won. Habanero provides quality mobile slot games for download or to play in instant mode from many places online. The game can be played for real casino money or for no money at all. In fact, you will be given free money to play and where in Vegas can you do that? Playing slots online is a whole new thing and savvy slot players will want to check it out. Are there other Golden Unicorn slot games? Golden Unicorn isn’t the only casino unicorn games so if this one doesn’t meet up to your expectations there are many to choose from and almost all the gaming developers provide at least one in their gaming catalogues. Play free mobile apps with slots featuring unicorns or other fantasy creatures. Of course when playing for free, no real money is involved. If the dollar signs of the Grand/Major/Minor Jackpots invite you to go to a real casino online, you will find that there are many casinos to choose from. Shop around and visit a few before deciding to play for real money. Are there bonus offers in Golden Unicorn play? Check out the quality of the games, the security of the site, and of the extra cash players will receive in bonus offers. Immediately after you become a customer the casino will thank you with free cash, match bonuses, free spins and other rewards. Rate this mobile slot after playing to flag down slot-lovers who will come looking for the best games to play just like you did. Share about slots on Twitter and play with a friend on social media like Facebook. Give and share gifts with those you play with. 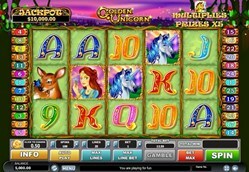 Although Golden Unicorn slot has a basic look with so-so graphics and the usual boring poker run symbols, the animation of the icons will get you going with a little more movement going on. Play in auto-mode for faster game play, take your mind off of something mundane or disturbing for a few minutes and play on the go wherever you take your mobile games, they go wherever you go.